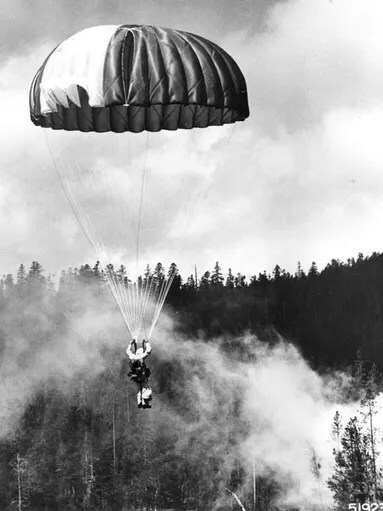 One Sunday morning, before driving to Church, I received two emails informing me of the deaths of two different men that were Smokejumpers with me. Back in our smokejumping days we all joked about “cheating death” every time we made a successful parachute jump into a wilderness to fight a forest fire. I will get back to that in a moment. I read the obituary of one of the men and looked at his picture. It was hard to remember his face and to recall our times together so many years ago. We were a small, tight group of 39 that had trained together and received our “wings” as Smokejumpers, but I couldn’t seem to remember a specific time with him. Amazingly, in the middle of last night I awakened remembering his name and a jump we made together on my mind. It was a small fire, so only two of us would jump. I had jumped first and was already on the ground (having cheated death once again…and if you knew my parachute landing skills, you might be in awe of that fact!). He was in the air, spinning 360’s and hollering like a wild man (we were all a bit crazy back then). As he approached the ground, I shouted out for him to watch out for all the big rocks and downed timber. He seemed rather oblivious of it all and kept circling me with his 360’s. As he neared the ground, suddenly his parachute caught a tree and like a giant pendulum he swung out straight toward me and then straight back to the tree. He crashed right into the trunk of the tree and was suddenly hanging limp about 30 feet in the air. I began yelling his name over and over again. But he just hung there limp. The jump plane kept circling waiting for us to indicate all was well, but it wasn’t well at that moment. Finally, after what seemed an eternity, his body moved and his first words were something along the lines of: “Where am I?” Once he established that he was hanging in a tree, he made his let-down, we put up the “all’s well” signal and went off to put out a fire. He had a bit of head-ache, but worked hard without giving it a second thought…at least to me. Now I share that story for a couple of reasons. One is of course to remember my friend and my jump partner in his death. What amazed me was the detail of my memory. It was like I was right there, reliving that moment like it was yesterday. Psalm 130:14 says: “I will praise You, for I am fearfully and wonderfully made! What a mind God has given us that such memories could be brought back on such short notice. I was longing to remember my jump partner and suddenly there he was…in vivid memory. Sadly, his obituary stated there would be no service. Instead, he asked all his friends to sit down with a beer and tell a story or as he put it, listen to someone else’s story. Perhaps all of us would benefit from listening to each other, but to have no service means that he may not have had a Church…perhaps no faith…perhaps no belief in God…and perhaps, sadly, no hope in life after death. This brings us back to that whole concept of “cheating death” and what that really means. No matter how much I may have joked around with my Smokejumper buddies about “cheating death,” the truth of the matter is that it seems like none of us can truly cheat death. Sadly, many folks try not to think about it (the ostrich approach to death) with the hope that it won’t ever happen. But in the history of humanity, only a couple of people have ever had that not happen, such as the Holy Prophet Elijah who was taken up by a fiery chariot. As much as I would like to have that fiery chariot arrive for me one day, the truth of the matter is that it will likely not happen. I too will face death one day, just as Bernie did. How I face it is a daily decision I need to make. The greatest enemy of mankind is truly death. But it need not be so. Here is the hymn that Orthodox Christians sing in celebration of the Resurrection of Jesus Christ: “Christ is Risen for the dead, trampling down death by death, and upon those in the tombs, bestowing life.” That greatest enemy has been defeated and we can look to Christ for our own victory over death. Wow…Death does not have to be the final chapter of our lives! Christ has trampled down death by His own death! As Smokejumpers, we thought we had an “S” on our chests, like Superman, and that we could “cheat death” with our invincibility (well at least some of us thought that). The reality is that there is truly only one way to “cheat death” for all of us. That way is through Jesus Christ. We will all have to go through that “portal of death” to the next world…but with Jesus Christ, it no longer has to have dominion over us. This Sunday would be a good day to be in Church to thank the One Who truly offers us the gift of life…eternal life. May the Lord grant you His peace each and every day!! Last week, I dropped by a friend’s house and found him on his hands and knees in the front yard. He was frantically searching for something. I went over to him and asked what was going on. He told me that he had lost the only keys for his truck and had to find them. I immediately dropped to my knees and joined the search. After about 10 minutes of fruitless searching I suggested that we stop and start from the beginning. I asked him to tell me exactly where he was when he lost the keys. He said he was inside the house!! After a moment of silence to gain my composure, I asked him what in the world he was doing searching for his keys in the front yard, if he had lost them inside the house! He explained to me that there was more light outside and thought it would be easier to search for them!! This modern parable (no I didn’t really find my friend looking for his keys) provides a good picture of this modern world we live in. There are so very many people looking for happiness; looking for “God”; looking for meaning to life; looking for healing for their emotional pains and scars… but sadly, they are looking in the wrong places! They are looking in places that “feel good”, or in a place that seems to be popular on television, or in an easy place to get to (one that doesn’t interfere with having fun). It is very much like the guy searching in the wrong place for those car keys because it is lighter outside, or the air is fresher, or because his neighbors are outside, or because he didn’t want to mess up the inside of the house. There’s an old country western song about “lookin’ for love in all the wrong places” that seems pretty appropriate. They may find something… but not what they really wanted or needed. Many folks are looking for answers to those tough questions in life or looking for healing from those pains, yet they refuse to acknowledge the Lord. They want physical or psychological answers to issues and they want no part of any spiritual answer. There are some things that we do need a physical or psychological help with, but to leave God out of the picture is simply discounting the ultimate healer and helper. This world has done its best to discredit the impact the Lord can truly make on someone’s life. They would have us thinking that God’s power doesn’t measure up to our hard hitting problems. It is better to look for life’s answers any place but with God. Many years ago, we lived in a small town that had an enormous problem with drugs and their young people. The City Council even advertised in the local paper asking if anyone knew of a way to help. The ministerial group of the town contacted them about a group that had enormous success working with young people using drugs. A meeting was set up and the very first question asked by the City Council was: “This group isn’t going to mention God are they?” They were told that God was the very foundation of the answer to this problem. They refused to even listen any further…they wanted the drug problem to be solved without God in the picture. The Holy Scriptures speak to us about what can happen when a person searches in the right place: “Come to me, all you who are weary and burdened, and I will give you rest”; “If any of you lacks wisdom, he should ask God, Who gives generously to all without finding fault, and it will be given to him”; “Ask and it will be given to you; seek and you will find; knock and the door will be opened to you”. Besides dealing with the pains of life in this way, many folks also seem to search for the TRUTH in exactly the same way as the man with the lost car keys. So many folks have bought into the idea that truth can somehow be “relative”. In other words, whatever is true for you is truth…we all arrive at our own truth. This sounds so very nice, but it totally misses reality. There really is TRUTH in this universe and no matter how much we may believe a lie, it will never become the TRUTH! Gravity is a nice example! I can believe with all my heart there is no such thing as gravity; I can proclaim to everyone who will listen that gravity is a fable; I can write best-selling books about the lie of gravity… but if that “truth” is ever tested by me stepping off the roof…well you all know that I will have discovered the hard way that gravity does indeed exist! TRUTH is an absolute!! Unlike the fairies of Peter Pan, TRUTH will continue to exist whether we believe it or not. This holds fast in both the physical realm and the spiritual realm! TRUTH is something we should pray for: “Guide me in Your truth and teach me” (Psalm 25:5). The words of the Holy Prophet Isaiah would seem to fit our world today as they did in his day: “Truth has stumbled in the streets… and they turned away their mind so as not to understand” (Isaiah 59:14-15). May we never turn our minds away from the TRUTH, rather may we be seekers after the TRUTH! When those pains of life or tough questions come our way, may we all humble ourselves and seek the Lord. There is only One who claimed to actually be the TRUTH…not simply to teach the truth or to point us toward the truth…Jesus Christ said: “I am the Truth…” (John 14:6). He is the One, Who has the healing touch and the answers. And may you have a heart that hungers for the TRUTH (and nothing but the TRUTH!)!! God bless you all, each and every day! !